I have a mavenized codebased configured Spring 3.2.4 web app. When I build the app with Maven/pom.xml first I got an error that web.xml is missing. first I tried to create an empty web.xml. this was the moment when The project facets changed (and I don't know why). It switched from dynamic Web Module 3.0 to 3.1 and this is irreversible. How can I change it again into Dynamic Web Modules 3.0??? Failed while uninstalling JAX-RS (REST Web Services) 1.0. Just make sure you configure the web module before applying it as by default it will look for your web files in /WebContent/ and this is not what Maven project structure should be. Exit eclipse, go to your project in the file system, then to .settings folder. Open the org.eclipse.wst.common.project.facet.core.xml , make backup, and remove the web module entry. You can also modify the web module version there, but again, no guarantees. Note that 3.0 and 3.1 are different: in 3.1 there's no Sun mentioned, so simply changing 3_0.xsd to 3_1.xsd won't work. I had the same problem and fixed this by editing org.eclipse.wst.common.project.facet.core.xml. That seemed to fix the problem for me. For me it was important to have Dynamic Web Module disabled! Then change the version and then enable Dynamic Web Module again. In a specific case the issue is due to the maven-archetype-webapp which is released for a dynamic webapp, faceted to the ver.2.5 (see the produced web.xml and the related xsd) and it's related to eclipse. When you try to change the project facet to dynamic webapp > 2.5 the src folder structure will syntactically change (the 2.5 is different from 3.1), but not fisically. This is why you will face in a null pointer exception if you apply to the changes. To solve it you have to set from the project facets configuration the Default configuration. 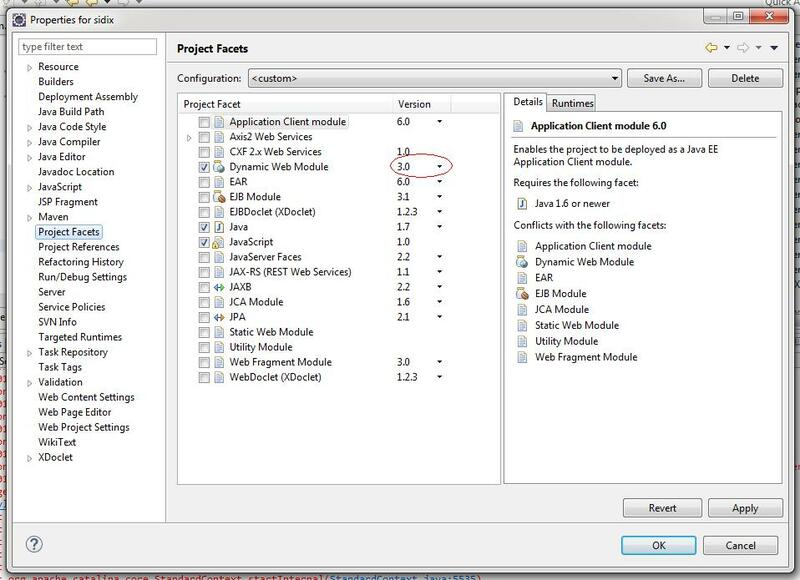 Apply the changes, then going into the Java Build Path you have to remove the /src folder and create the /src/main/java folder at least (it's also required /src/main/resources and /src/test/java to be compliant) re-change into the required configuration you desire (3.0, 3.1) and then do apply. I opened the project org.eclipse.wst.common.project.facet.core.xml and first changed then removed line with web module tag. Cleaned project and launched on Tomcat each time but it still didn't run. Returned line (as was) and cleaned project. Opened Tomcat settings in Eclipse and manually added project to Tomcat startup (Right click + Add and Remove). Clicked on project and selected Run on server....and everything was fine. Not the answer you're looking for? Browse other questions tagged eclipse spring maven spring-mvc or ask your own question. 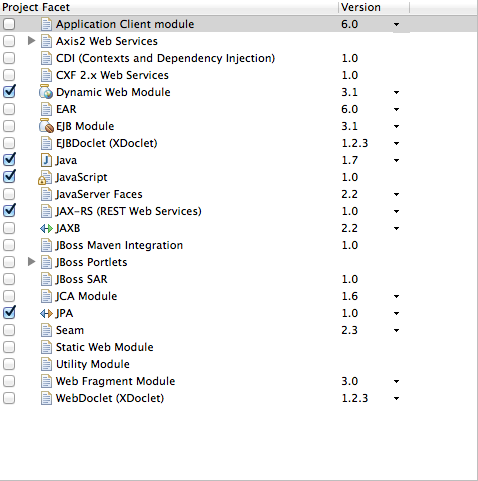 How to import jdk 9 maven spring boot 2 projects into eclipse ee oxygen without Dynamic Web Module 3.0 facet hacks?